Anodic linear-sweep voltammetry (ALSV) was applied to electrodeposited alloy layers and to metallurgically obtained Cu−Zn alloys of different composition and structure. Metallurgically obtained samples covered the range of composition in which α, (α+β), β and (β+γ) intermediate phases were detected by X-ray. The ALSV of samples containing less than 30 wt % Zn exhibited a single peak at −0.08 to −0.1 V/SCE before massive dissolution, starting at about −0.05 V/SCE. The presence of the γ-phase gave another peak at a significantly more negative potential (−0.25 to −0.35 V/SCE). The ALSV of electrodeposited alloys were significantly more complex than the former, depending on the deposition potentials, with peaks attributable to pure Zn, to the ε-phase, to the η-phase as well as to the α-phase, present in most cases and dissolving at potentials similar to that of pure Cu. 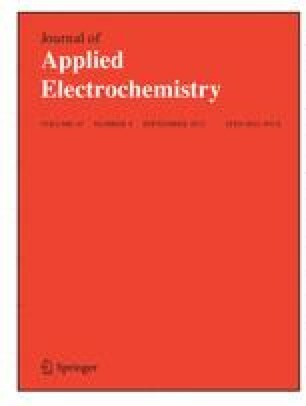 ALSV was shown to be a reliable and practical method for a fast determination of both the composition and the phase structure of electrodeposited brass.